Looking after our skin and environment should just be as important to us as it is looking after our diets. This 2 in 1 oat and banana facial scrub and mask does the job of your usual facial scrub – minus the nasty toxins and ingredients that can be found lurking in our drugstore products. 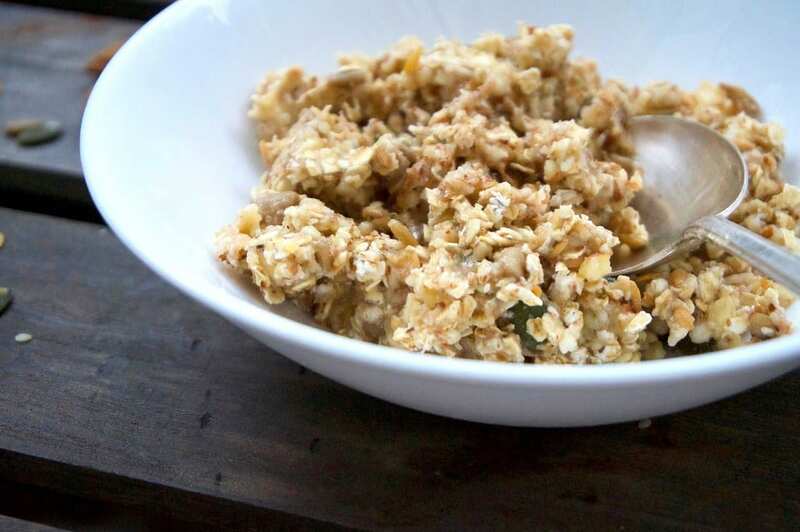 This oat and banana facial scrub is incredibly easy to make, works wonders and is packed full of natural and nourishing ingredients. Since making my own skincare products I’ve fallen even more in love with honey and it’s slowly become a skincare favourite of mine. If you’re not a fan of raw honey for baking/cooking with, then save it for your homemade skin products instead. Using honey in skincare products can be really beneficial for your skin. Raw and organic honey has humectant and skin-brightening alpha hydroxy acid properties which gives us that ‘glow’ afterwards. It is also very antibacterial which means it will help to relieve tired and blemished skin. 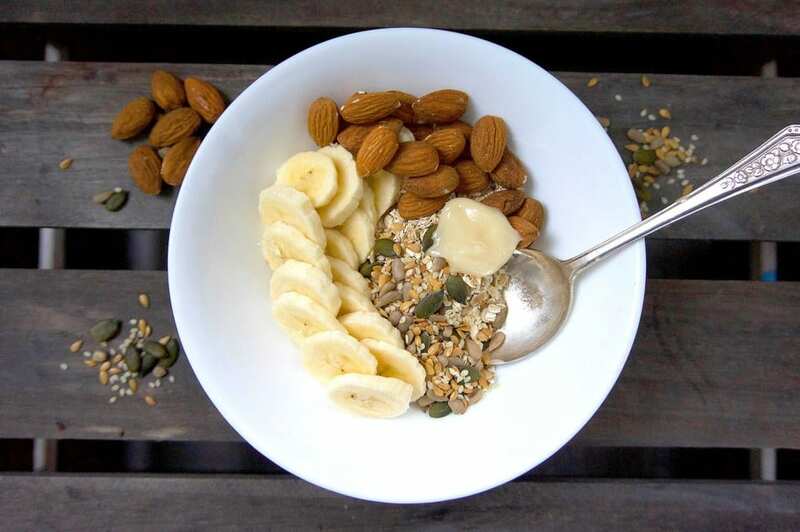 The addition of bananas also adds a boost of skin vitamins, including the two most important ones for healthy and brightening skin, vitamins A and E – these are amazing for enhancing natural beauty! The rough chopped almonds and tsp of flax seeds (or mixed seeds) gives this 2 in 1 facial scrub and mask the much needed texture for a gentle, yet efficient scrub. After all, it’s important that we wash away the dirt and grime from our everyday activities! If however, you have dry skin then I would skip the almonds and create a softer paste that will be more nourishing for your skin combination. Homemade masks and scrubs (especially this one due to the bananas) are best made up in one-use quantities for it’s freshness. This however, shouldn’t be a problem as this recipe is incredibly quick and easy to make. Of course, you can whatever ingredients you want but this particular recipe is a favourite of mine and it does the trick of scrubbing the day away. 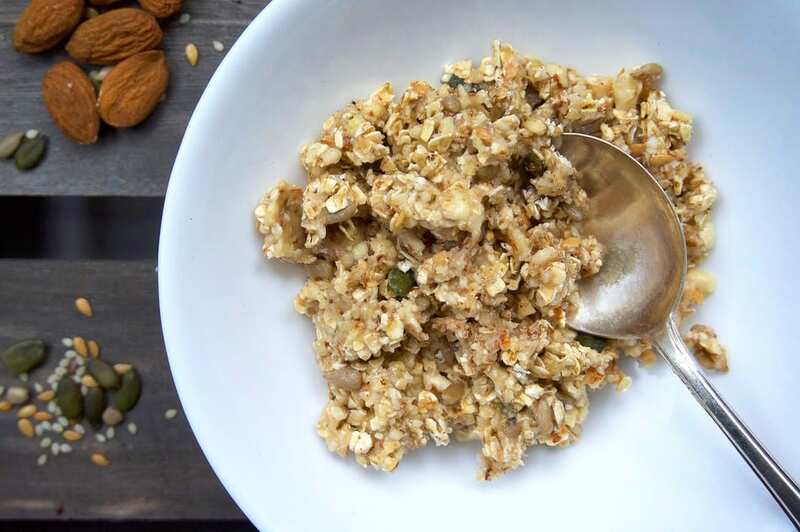 If you’re using this as a scrub then simply splash your face with warm water, massage the paste onto your face and let the chopped almonds, seeds and oats do the scrubbing. Finish by washing away the scrub with warm water. If however you’re using this as a mask then slather this onto your face and let sit for 5-10 minutes before massaging into your face. Once done, wash away with warm water. All ingredients are incredibly natural so this shouldn’t irritate your skin at all, but if it does then quickly wash away with warm water and pat your skin dry. I hope you enjoy this natural and nourishing 2 in 1 scrub and mask as much as I do! A natural and nourishing 2 in 1 facial scrub and mask that's Primal and Paleo friendly. In a food processor grind together the almond and flax seed. 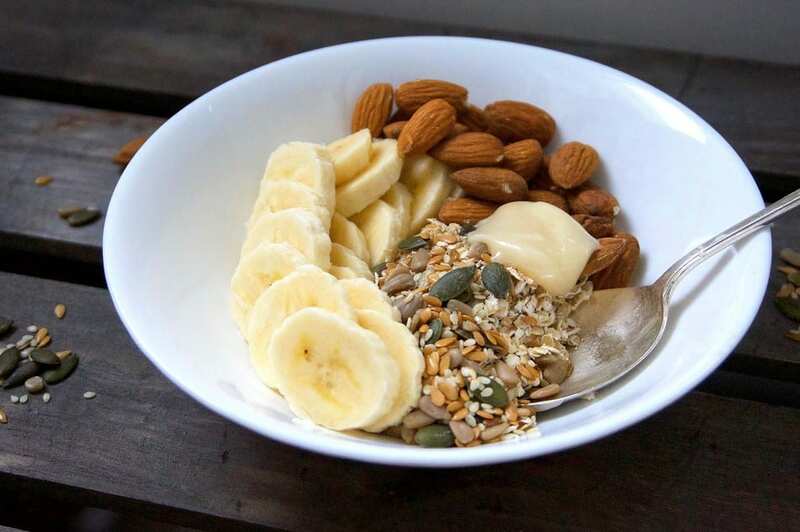 Add the banana, oats and honey and whizz everything together. Once mixed and you reach a scrub like texture, remove your mask/scrub and use straight away for freshness.